Put the power of lightening quick small package dimensioning to work for you. FS PARCEL delivers NTEP-certified measurements of boxes, tubes, poly envelopes, bags and other irregular-shaped objects in under a second. A valuable addition to any warehouse or office setting, FS PARCEL can help you improve your team’s efficiency, ensure accurate measurements, obtain more exact shipping quotes and ultimately lower your cost of doing business. 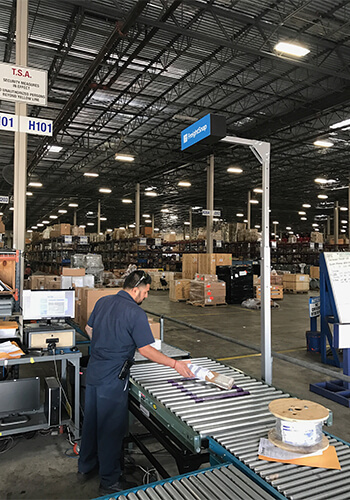 For pricing information, or to see if FS PARCEL is the right package dimensioner for your operation, request more info today. Height: ±0.25" | Width/Length ±0.50"
FS PARCEL is high on performance and low on price, offering users powerful measurement capabilities and flexible integration with existing WMS and back office software. Not only that, but FS PARCEL comes equipped with our FS ShipManager software, which allows you shop quotes and print labels from major package handlers like Fedex, UPS and USPS in just a few clicks. 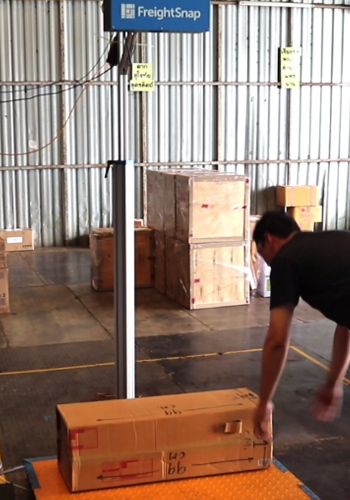 If you’re looking for an all-in-one shipping station, FS PARCEL could be the perfect solution. 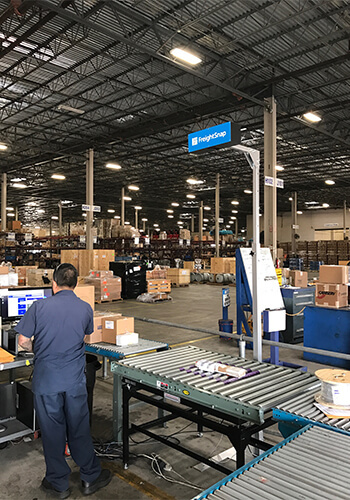 FS PARCEL can be installed over the top of virtually any level surface, including tables, work benches, conveyor belts, roller belts, package scales and more. Assembling the unit is quick and easy, and operation is intuitive. Within minutes, you’ll be ready to dimension your small package shipments and start collecting valuable dimensional data. Fully assembled dimensions Width: 20" | Depth: 30" | Height: 133"
Required height of sensor above surface 90"
FreightSnap has developed two convenient methods for initiating scans from your dimensioner. Choose the option that works best for your workflow. Recommended for companies who don’t use barcodes to inventory their freight. The triggering app comes pre-installed on a mobile device or computer, either of which can be placed at a workstation near the dimensioner, or installed on the forklifts in your operation. Recommended for companies who use barcodes to inventory their freight. 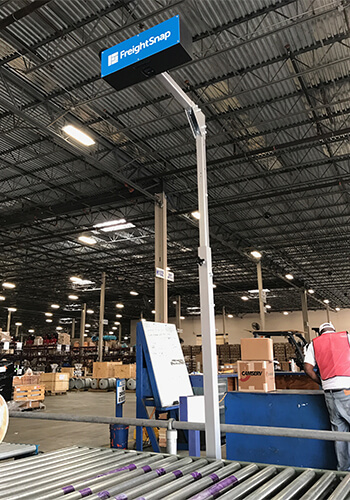 Outfit each forklift with its own barcode scanner, or place a scanner at a nearby workstation to maximize throughput.